Do you have an amazing vegetarian mother-in-law like me? Perfect. This card is one of our favs. Spotted in Dépanneur Brooklyn last year we held onto this gem until the high holiday of mother’s rolled back around. 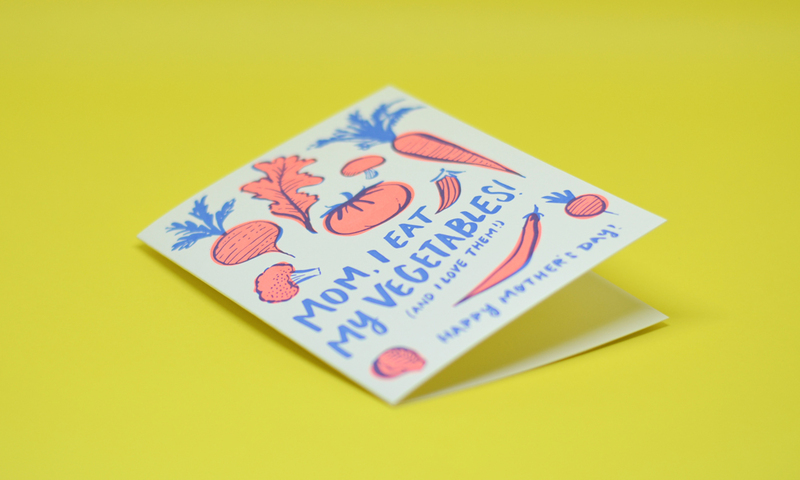 Drop this I Eat My Vegetables Card atop a basket of hand picked, farmers market fruits and veggies and you’ve got yourself a Mother’s Day mic drop. My mom just had a way of mixing the powdered cheese with the hot butter and then coaxing them to cling to the boiled elbow noodles patiently waiting in her stainless steel Sears farberware sauce pan. No matter what your relationship to cheese and macaroni they are an undeniably inseparably pair. These days the fanciest of childhood treats can run up into the triple digits when paired with foie gras, caviar or gold flakes. Under the most glamorous of cloaks the working mans duo is still about one thing which is illustrated perfectly in this Mac to My Cheese Card. Some things are meant to be together and stay together. 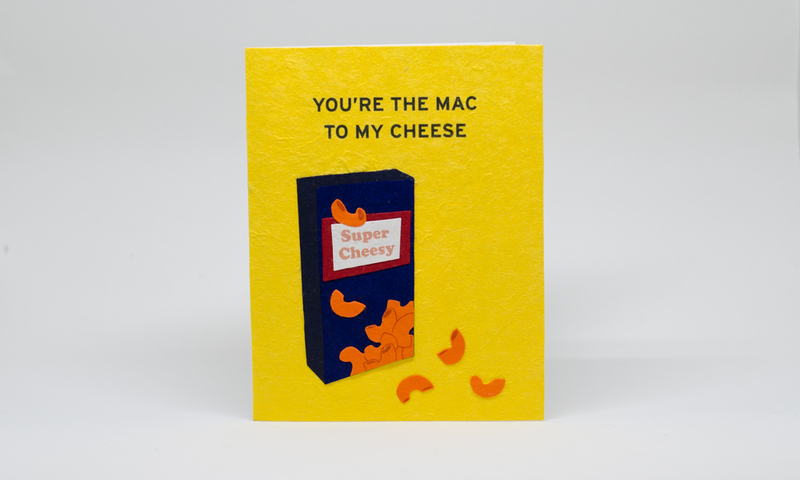 Much like the comfort of Mac and cheese, this card can be there for the recipient (or you) when your mom can’t. We know it’s not the same but it’s better than nothing. If I handed you a steak scented sponge you’d probably think I was pining for a role in True Blood. 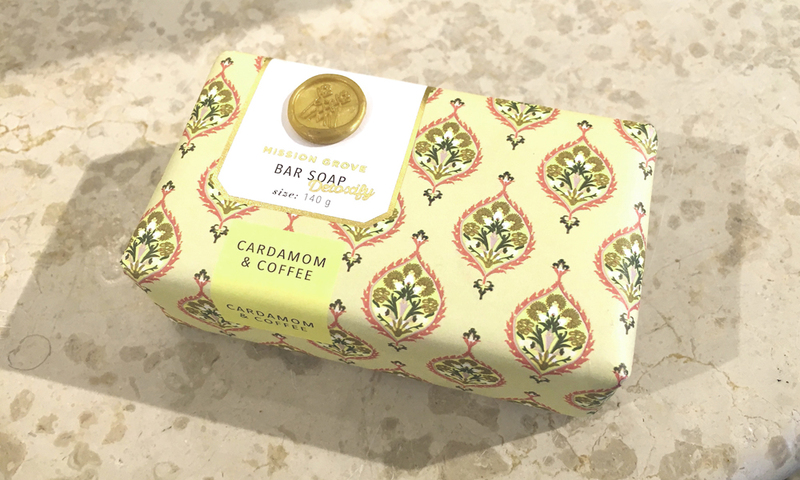 That’s why Mission Grove Cardamom Coffee Soap makes sure their blend of scents makes for the perfect clean, fresh, olfactory delight instead of a vampire induced, midnight frenzy. Mission Grove makes other scents but this South Indian and caffeine combination scratches two of our continual itches, love of the subcontinent and our habitual morning cup of comfort. Food and Christmas go hand in hand. With the current slobbering over all things edible, it’s no wonder the food ornament game has stepped up to the plate and started hitting homers. No better place to snap up one of these winners than Terrain, the Urban Outfitters folks take on outdoor stuff. 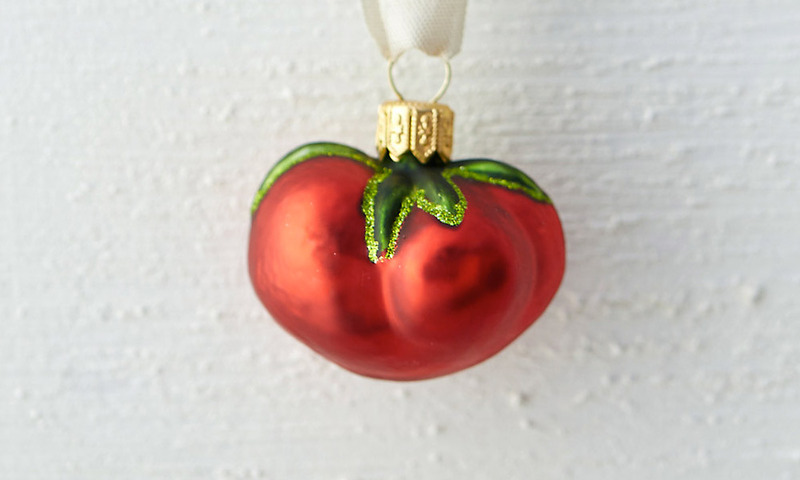 This Glass Tomato Ornament is one of our favs because it’s a building block of many recipes and a beautifully simple summer fruit we rarely get to see in winter. Hanging off our tree we want to puree them up and make a red sauce for our raviolo but that would make for a disaster. Obviously, made for memories, there glass vegetable line is meant to remind us how good the real thing is and wait for summer. That’s cool, we’re asking for heirloom seed for Christmas. When we land in Montreal we head straight to Beauty’s. It doesn’t matter what day, time or reason for the visit, we always find ourselves in a booth at the famed diner in about 40 minutes after touchdown. Last weeks trip was no exception. My move is always a St-Viateur Bagel with lox, cream cheese and tomato, collectively known as the Beauty’s Special. On this visit there was a new addition, The Beauty’s Shoppe. Jumping on the merch train, and I don’t blame them, the owners enlisted, designer and illustrator, Sasha Endoh to ink some classic menu items. 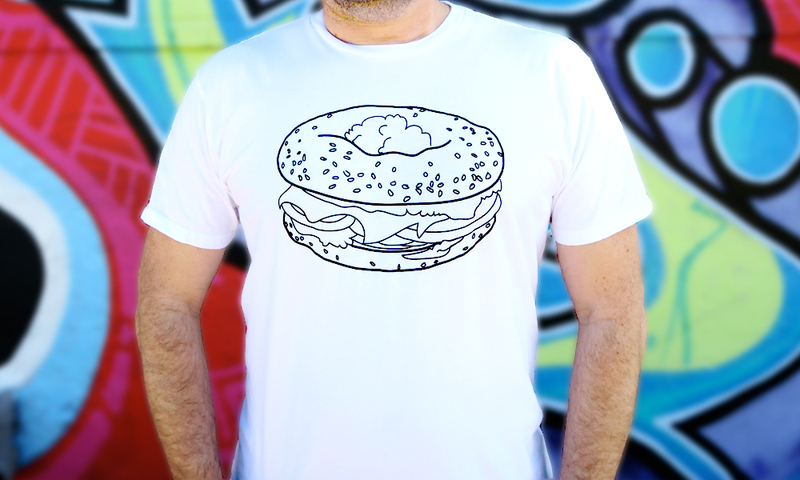 The Beauty’s Luncheonette Bagel T-Shirt was a no brainer for me. Sasha’s simplistic black and white design makes for an understated badge I can use on my home streets of NYC proclaiming my favorite bagel breakfast.